This challenging trek to Everest Base Camp takes you through some of the most glorious mountain scenery in all the Himalya - the relatively untrodden Gokyo Valley to the sacred turquoise lakes of Gokyo. After enjoying a couple of days in Kathmandu, we'll fly to Lukla, following the Dudh Kosi River into Sagarmatha (Everest) National Park and to the Sherpa capital Namche Bazaar. We'll take an extra day in Namche to rest, acclimatize and explore. To aid acclimatization, you can day hike to Khumjung, home of the first Hillary school and a gompa (monastery) containing a skull of the legendary yeti. Setting off from Namche, we'll trek a high, open trail that reveals the great depths of the valleys and heights of the surrounding mountains. We will make a steep descent through rhododendron and pine forests to reach our campsite in Phortse Tenga (Phortse "by the river"). Our next morning's hike will bring us to Dole. The varied terrain and increase in altitude make for a challenging hike; we'll take an extra rest day in Machermo before heading on to Gokyo Lakes. On your first afternoon in Gokyo, you can hike along the lakeside trail, or sit back and enjoy the reflection of the surrounding peaks in the lake's glacial waters. Rising for an early morning start, we'll climb to the summit of Gokyo Ri (17,548'). From its top, you'll have a view rivaling the celebrated vista from atop Kala Pattar seen later in our trek. 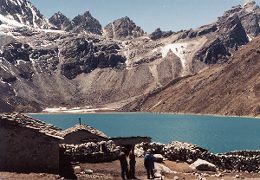 By now feeling fit and acclimatized, we will travel across the Ngozumpa Glacier, camping the night at Thangnak. We'll continue the next day over the infamous Cho La (17,778') to Dzongla for hot tea and a well-deserved rest. From Dzongla, we will gradually make our way to Lobuche along the lateral moraine of Khumbu Glacier and on to Gorak Shep at the base of the 18,188' Kala Pattar, the "Black Rock". You can hike to the top at for sunset views or make early morning climb to its summit for a panoramic view of some of the highest peaks of the Himalaya, including Everest at 29,035', Nuptse and Pumori. 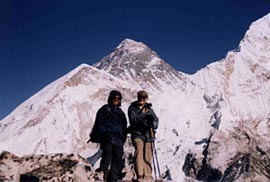 Everest Base Camp is at the foot of the imposing Khumbu Icefall, a 3-hour trek from Gorak Shep. Depending on the time of year, we will visit with members of the Cabaret Diosa mountaineering expedition team preparing for their climb of the world's highest mountains. We will make our way back to Lukla via Tengboche, with its beautiful monastery, completing the loop in Namche Bazaar. Enjoy celebrating Thanksgiving with our Sherpa before flying to Kathmandu. Our team will be Sherpa supported, with porters and/or yaks to carry gear while you hike with a light day pack, allowing you to acclimate and enjoy the trip to the max. Our experienced staff will trek with the group, set up the tents, cook all the food, which includes excellent Western and Eastern cuisine, and provide support for all levels of ability and interest. Contact Us for detailed itinerary.